The islands of Kagoshima are scattered across a range of 600 km extending roughly from the 32nd to the 27th parallel north. The main islands in Kagoshima, from north to south, are the Koshiki, Uji, Kusagaki, Osumi, Tokara, and Amami Islands, and are composed of about 600 islands. A group of islands from the Osumi to Amami Islands is, together, called the Satsunan Islands. Comprehensive ichthyofaunal surveys of the islands of Kagoshima have not been previously conducted. The distributions of various fish species have been commonly described in books and papers as roughly “the Ryukyu Islands” or “the Satsunan Islands”. However, recent large-scale surveys in the region by the author and his colleagues have revealed that each island has a unique ichthyofauna, and many species are not widely distributed over several islands. In this presentation, the biogeography of fishes in the Satsunan Islands and the unique ichthyofauna in Yaku-shima are detailed, with a report on the latest surveys carried out in the Koshiki and Uji Islands. In Kagoshima Prefecture, more than ten fish species are now registered as critically endangered species by the Ministry of Environment. Ryukyu-ayu, Plecoglossus altivelis ryukyuensis, is one of them, the wild population of which is found only in Amami-oshima Island, Kagoshima Prefecture. Ryukyu-ayu is a subspecies of Ayu, Plecoglossus altivelis altivelis, which is one of the most commercially important species in Japanese inland fishery and widely distributed from the mainland of Japan to Yakushima Island of Kagoshima Prefecture. They are amphidromous species as well as P. altivelis altivelis, their larvae and juveniles using estuarine and coastal regions as their nursery areas for several months from winter to early-spring. We have performed extensive collaborative ecological studies with Ryukyu University, other universities and institutes to understand deeply how fish live in the natural environments. 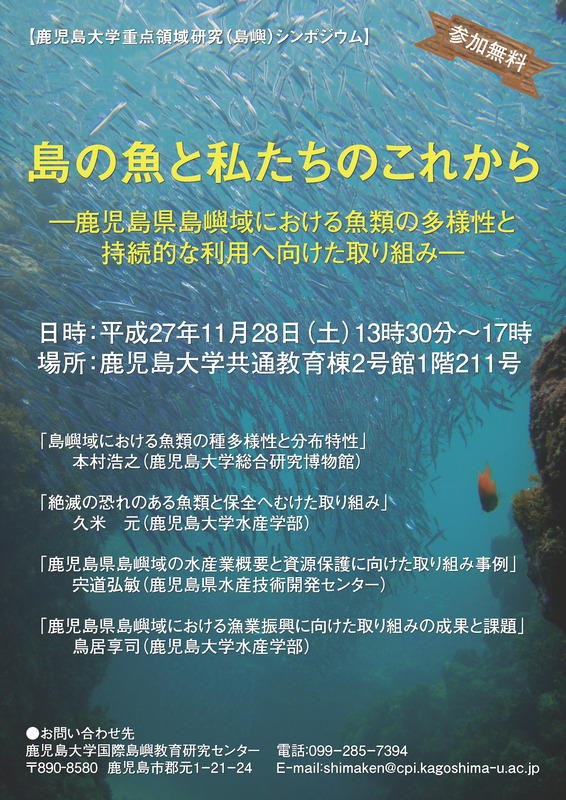 In the presentation, I introduce the latest findings on ecological traits of Ryukyu-ayu and outreach activities for local people and pupils of elementary schools to conserve the species them in Amami-oshima Island. Kagoshima is extensive as spreading about 600 km from temperate to subtropical zone, where is composed of Satsuma and Ohsumi peninsula and many islands, e.g. Shishijima, Koshikishima, Tanegashima, Yakusushima, Tokara islands, and Amami islands. The coastline length of Kagoshima is 2,664km, the third longest in Japan. The oceanic environment around Kagoshima is complicated because of complex coastline and bottom shape of the ocean, and influence of the Kuroshio current, the route of which fluctuates day by day. The marine fisheries and aquaculture production value in Kagoshima is 76.6 billion yen, fourth in Japan. The islands of Kagoshima and the population living in there are the most remote in Japan, so marine fisheries and aquaculture are active as one of the major industries. Even though the fishermen’s life environment is severe, there are many efforts in resource conservation by fishermen. Here, I present the characteristics of fisheries and the oceanic environment in Kagoshima, especially its remote islands, and efforts in resource conservation by fishermen as a voluntary initiatives in remote islands, for example banded blue sprat (Japanese name “Kibinago”) in Koshikishima and deep sea snapper (Japanese names “Hamadai, Aodai, Himedai, Ohhime”) in southwestern islands. Kagoshima prefecture has numerous remote islands that are dependent on fishery industries for survival. This research aims to analyze the present conditions and challenges faced in these islands in the promotion and marketing of fisheries. Fisheries products and shellfish from Kagoshima’s remote islands are mainly shipped and consumed by people in the mainland, supporting food security. In recent years fisheries management and production are increasingly challenged as the results of high transportation costs, fuel price, and high costs of fishing gear and materials. There is an increase in the price of shipping and challenges in maintaining freshness that determines the prices of the catch; as a result the prices during auctions are lower as the result of the deterioration in freshness. These problems combined with a decline in fishery resources have resulted in the weakening of island economies and affect fisheries supply to the mainland. The discussions of these challenges will focus on three case studies of Koshiki Island, Nakanoshima island and Yoron Island. The analysis will focus on capital investment for the purpose of local promotion in Koshiki Island, the frozen shipment system in Nakanoshima and the promotion of artificial fishing reef implemented in Yoron Island. Through the analysis of the three case studies, the challenges faced by remote island fisheries will be clarified.